Dr. Nizam Peerwani, Chief Medical Examiner of Tarrant County. 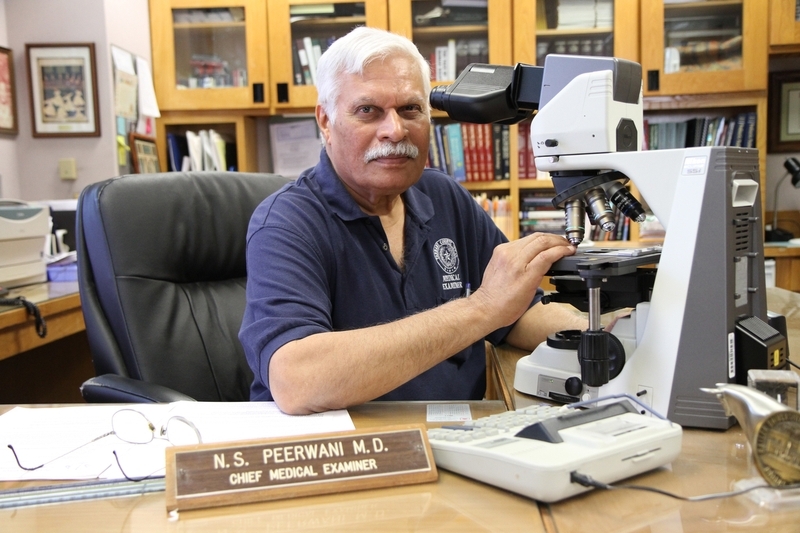 Although the deaths occurred in McLennan County (where Waco is located), Peerwani's office in Tarrant County was selected to do the autopsies. (Official Tarrant County publicity photo). "The principle of plausible denial is simply if an operation or act is later disclosed, for example, as an action of the United States government, the government can plausibly deny it, deny any involvement or connection with the action." —E. Howard Hunt, ex-CIA operative, quoted by Mark Lane in Plausible Denial. The Mt. Carmel Center was situated outside Waco, in McLennan County, but the remains of the Branch Davidians were taken to Tarrant County, where the chief medical examiner of the Tarrant County Medical Examiners Office was Dr. Nizam Peerwani. During his testimony at the 1994 San Antonio trial of the Branch Davidians, Dr. Peerwani indicated the reason the autopsies were transferred to him was the superiority of autopsy facilities in Tarrant County (Transcript, pg. 5961. Among other facilities, Dr. Peerwani said he had a physical anthropology lab, a DNA lab, and a fingerprint examiner (Transcript, pgs. 5961 and 5965). It was also evident that Dr. Peerwani was not in control of the identification process when he told the court on February 11, 1993 that the remains of Davidians Greg Summers, Scott Sonobe, and Jeff Little had not been identified. In fact, the remains of these men were identified several days before Dr. Peerwani's testimony, on February 8, 1993. "See Identification Matrix." Note that the three were identified by DNA testing. Obviously the DNA work was not done in the lab over which Dr. Peerwani presided, and for which his office was supposedly chosen. The IDs were obviously done in the FBI labs, just has Sherri Jewell's ID had been done. The FBI lab did not keep Dr. Peerwani posted of its progress in a timely fashion, and thus his testimony was dated. Note that the Identification Matrix supplied by the Justice of the Peace of McLennan County does not bear any marks of official authorship. This ID Matrix is discussed more fully elsewhere in the Death Gallery. Maps of Texas show that there were other large urban centers close to the Mt. Carmel Center. For example, the cities of Austin, Dallas, Houston, and San Antonio were all within easy driving distance of Waco. The bodies could have been put in refrigerated vans and driven to any one of those locations. Dr. Peerwani claimed that he had been called into the situation by the McLennan County Justice of the Peace, Judge Pareya (Transcript pg. 5962). However, Mt. Carmel was in Precinct 2 of McLennan County, which is under the jurisdiction not of Judge Pareya, but of Judge Collier. The appearance of "local control" did not even go skin deep—it was a veil to be used and dropped at will. Certainly the assault on the Branch Davidians was conducted by federal militia and the surviving Branch Davidians were tried in federal court for conspiracy to murder the ATF agents; but Dr. Peerwani was the chosen "local" for the autopsies. Why was the Fort Worth Medical Examiners' Office in Tarrant County chosen? Because Dr. Peerwani was a man with a reputation for incompetence. that Dr. Peerwani had not completed a formal fellowship in forensic pathology as was customary with other qualified experts in the field. The FBI and the Texas Rangers no doubt were as well informed on Dr. Peerwani's reputation as was defense lawyer Kearney. According to Mr. Kearney (The Dallas Morning News, April 22, 1993), three other pathologists — including one from Atlanta, Georgia — volunteered to oversee the gathering of remains. But Dr. Peerwani was still chosen. Dr. Peerwani was a good choice for persons who did not want the cause, manner, or time of death known. He could be relied upon to do clumsy, inept autopsies that would further destroy the bodies, and come up with nothing to incriminate the murderers. He provided an excellent layer of plausible deniability for the US government. He, not the US, could be blamed for having bungled the autopsies. Further inquiries into the causes and manner of death of the Branch Davidians would be shrugged off as hopeless. Dr. Peerwani's selection as autopsist was part of a program of orchestrated incompetence, just as we saw in the Kennedy assassination. We will see how the orchestrated incompetence of the Two Stooges, the Texas Rangers and the Tarrant County Medical Examiners Office, worked to accomplish the US government's plausible denial. The responsibility for the alteration of the crime scene and the destruction of evidence in the corpses of the Branch Davidians would now be shouldered by others. It might be legitimately asked why the Museum has accepted any of the information contained in Autopsy Reports written under Dr. Peerwani's direction. The answer is that those reports are the official reports. While the Museum questions the veracity of many of the causes of death cited in the reports, we do not question the direct observations on the condition of the corpses. The autopsists had little reason to exaggerate the ghastly condition of the corpses—to do so would make the US military and the para-military forces of the FBI and ATF look even worse. If the condition of the bodies was inaccurately described, the FBI, the Texas Rangers, and the forensic anthropologists from the Smithsonian Institution had every opportunity to protest and have the autopsies redone. They did not.